Mount Gongga (simplified Chinese: 贡嘎山; traditional Chinese: 貢嘎山; pinyin: Gònggá Shān), also known as Minya Konka (Khams Tibetan pinyin: Mi'nyâg Gong'ga Riwo), is the highest mountain in Sichuan province, China. 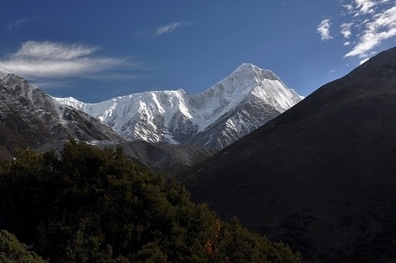 It is also known to locals as "The King of Sichuan Mountains". Situated in the Daxue Shan mountain range, between Dadu River and Yalong River, part of the Hengduan mountainous region, Mount Gongga is the easternmost 7,000 metres (23,000 ft) peak in the World and the third highest peak outside of the Himalaya/Karakoram, after Tirich Mir and Kongur Tagh. The peak has large vertical relief over the deep nearby gorges. In 1930 the explorer Joseph Rock, making the first attempt to measure its altitude, mis-calculated its height as 30,250 ft (9,220 m) and cabled the National Geographic Society to announce Minya Konka as the highest mountain in the world. This measurement was viewed with suspicion from the start, and the Society's decision to check Rock's calculations before publication was well-founded. Following discussions with the Society, Rock reduced the claim to 7,803 m (25,600 ft) in his formal publication. In 1930 Swiss geographer Eduard Imhof measured 7,590 m (24,900 ft). A second, better-equipped American team returned in 1932, and did an accurate survey of the peak and its environs. Their summit altitude measurement agreed with Imhof's figure of 7,590 m. Two members (Terris Moore, and Richard Burdsall) of this small expedition (only four climbing members, including Arthur B. Emmons and Jack T. Young) succeeded in climbing to the summit. They began on the west side of the mountain and climbed the Northwest Ridge. Here's the our members favorite photos of "Peaks or Summits in Sichuan". Upload your photo of Mount Gongga! Connect with Vanik Malhotra, Langtucui and 1 other members who are looking to visit Mount Gongga.